24: Twenty four of the most beautiful ladies in South Africa wait anxiously to find out who made it to the top 16 of Miss SA 2012. The winner will be crowned on Sunday, December 9 at the Sun City Superbowl which is in the Northwest Province. As we draw closer and closer to the elusive and elite Top 12, Miss SA concluded the 4th installment of the "Road to Miss South Africa" where eight semi-finalists were eliminated. Motivated: Natasha Kashimoto was one of the top 5 finalists in 2010. 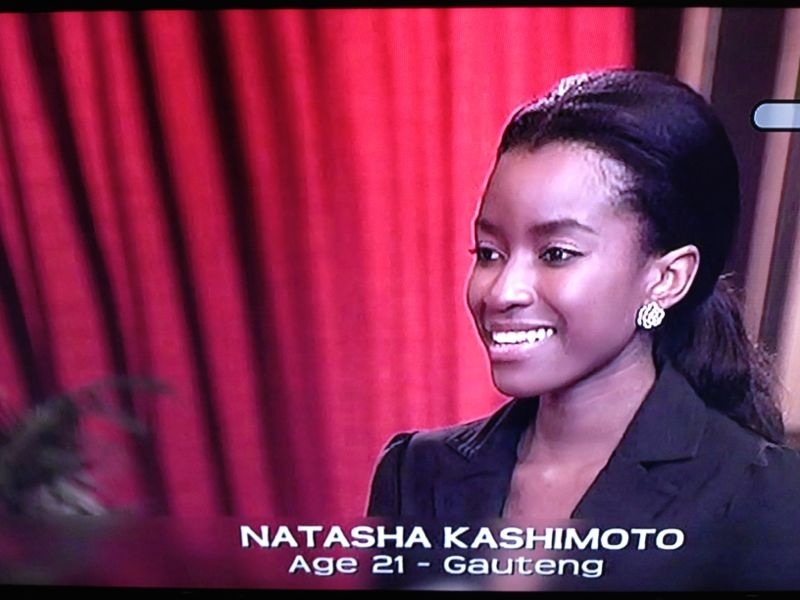 She also represented South Africa at Miss International 2011 in Chengdu, China where she was not included in the top 15. Will she be the next Miss South Africa? It must be noted that many girls have returned from previous years. Below is a list of the contestants who have entered before, and there placement. There was one final task before making the big cut, the fitness task which was won last year by our stunning Melinda Bam. With the judges overseeing all, the contestants were put through their paces and a Top 3 was named: Charne King, Naledi Willers and Simone de Kock. There was no bottom three for this round of competition. During that afternoon, three of the judges briefed each contestant on what they thought was their strengths, weaknesses or things they found somewhat displeasing or even distressing. The judges involved for this briefing are the three that have been consistent at judging this competition throughout namely principal judge Sonia Raciti, Kieno Kammies and Sonia Sedibe. Before I continue, I'd like to say that I think Sonia Raciti has the correct formula of choosing our winners. She has been head judge since 2008 when Tansey won. But she sometimes does try and overpower other judges, she often interjects while other judges are talking and comes off as the "queen" who knows it all. She and Kieno also happen to agree on everything and I picked up several times how she smirks when he has something to say. As far as Kieno's credentials go, he needs to be more of a man, stop tweezing his eyebrows, and ask questions properly without adding words like "lekker" and being rude to contestants. I think this should honestly be his last year as he annoys me personally, and I've read several reviews on other sites who all seem to agree on one thing: stick to radio. Sonia Sedibe is just lovely and seems to be very sincere and honest to me. Each contestant came in the room and the judges spoke to them. Here are a few opinions. 10. They all love Simone de Kock, Koketso, Marilyn. After the one on one assessment, the girls reappeared in swimwear for a final scoring, thereafter appeared for a final interview. It became apparent from the judging that Pearl and Naledi were late and made the group late, which infuriated the judges. Pearl was first to enter the judges room. She barely greeted when Kieno asked, "um, how do u feel about lateness?"... The other judges then asked her to take a seat. She then answered, "I think it makes you look very unprofessional..." Before being interrupted by Keino again. "Have you ever been late?" Pearl replied: "Yes I have because I'm usually fluffing about the small stuff which I think I shouldn't be as it inconvieniances other people. Sometimes you have to wait for your partner to finish in the bathroom..." she added before being interrupted again, this time by Sonia. "If I have a business meeting and someone was late, I would get up and walk away and I actually won't give them business and I know we coming down hard on you but I don't really care." The poor child looked so terrified and Sonia looked really angry. Laying Down the Law: Sonia Raciti and Kiemo Kammies have been grilling the contestants and, at times, given them a real hard time. The fate of the contestants are in their hands. Over the next few dayss, they wil decide who is the new Miss SA! Next in was Cindy Rossling, a psychology student. Keino asked, "Do you believe mothers who kill their children that are found to be not so lekker upstairs, do you think they should get off?" to which Sonia rolled her eyes and exclaimed, "Next question please!" But Kieno was insisting she answer which she did and handled herself quite nicely. Dhesha was next and was asked about kids being given too much homework and not spending time with their familes. She handled the question with much eloquence and said homework in itself can become a family thing where all participates. From a Princess to a Queen?! : 24 year old Dhesha Jeram is the hot favorite to become the next Miss SA. She was the runner-up to Bokang Montjane in 2010. Jeram was also Miss Supranational South Africa 2011 and finished in the top 20 at that pageant. At the moment, it seems like the title of Miss South Africa is Dhesha's to lose. We will find out on December 9. The judges finished the poor thing and one would naturally feel sorry for her. Sonia in particular was not impressed and told Naledi to reassess why she is there in the first place. I personally think they were way too harsh on her. A common question asked was about the nationalisation of the mines, which stumped certain contestants like Chane Fortuin. After this round of competition was the next round of elimination where the contestants were split into three groups of 8. Two groups went straight to the Top 16 and the remaining group of 8 contestants namely Chane Fortuin, Lebogang Monggae, Lucky Mthembu, Naledi Willers, Nompumelelo Msimango, Noxolo Mapoma, Sonia Ramautar, and Zahrah Perry are now eliminated. Next week: stay tuned for the Top 12 and our personal opinion as well as predictions for the winner and her court. Wher is your MU's pre arrivals leaderboard?